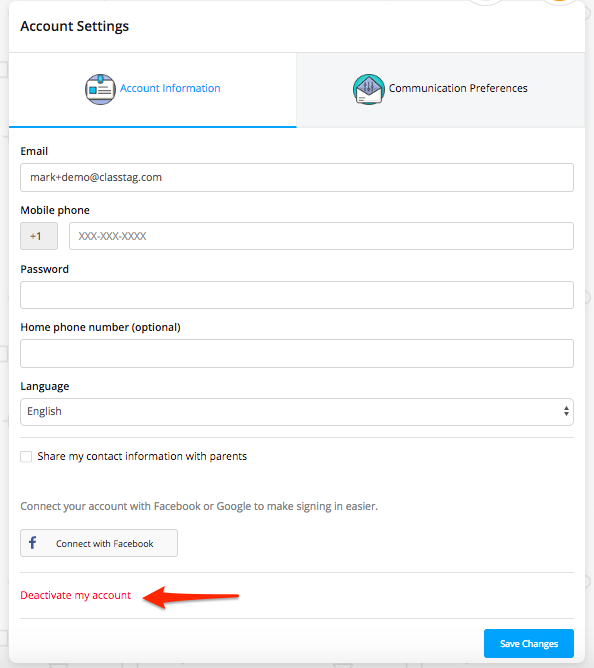 Instructions on how you can close or delete your account on ClassTag. We don’t want this to happen, but in case you really decide to leave ClassTag, please follow these steps on how to cancel or delete your account. Please note that once you remove your account on ClassTag, we won’t be able to reactivate it or retrieve any data anymore. 1. Log in on ClassTag. 2. Click the three lines on the upper left side and go to “Account Settings”. 3. Please go to the “Account Information” tab, scroll down and click “Deactivate Account”. 4. A pop-up window will appear with a box where you need to type in your email address or mobile number. Please type in exactly what is showing in the box. 5. Once done, click on “Confirm”. We’re sorry to see you go, but if you want to give ClassTag another shot in the future, please don’t hesitate to create an account again. How do I reset my ClassTag password? How do I consolidate parent accounts? How do I opt-out of text messages from ClassTag?